Introduction. Quantum Theoretical Techniques. Interaction with electric field. Time independent perturbation theory. Time dependent perturbation theory. Transition rates. Spectral intensities. Transition polarizabilities. Diatomic Molecules. Vibrational equation. Energy levels of harmonic oscillator. Energy levels of anharmonic oscillator. Energy levels of Morse oscillator. Electric dipole transition moments of harmonic oscillator. Electric dipole transition moments of anharmonic oscillator. Electric dipole transition moments of Morse oscillator. Magnetic dipole transition moments of harmonic oscillator. Magnetic dipole transition moments of anharmonic oscillator. Transition polarizabilities. Polyatomic Molecules. Energy levels of harmonic oscillators. Energy levels of anharmonic oscillators. Electric dipole transition moments of harmonic oscillators. Electric dipole transition moments of anharmonic oscillators. Magnetic dipole transition moments of harmonic oscillators. Magnetic dipole transition moments of anharmonic oscillators. Vibrational Analysis. Cartesian displacement coordinates. Internal coordinates. Energy distribution. Non-equilibrium geometries. Redundant internal coordinates. Local Modes. Hamiltonian in local coordinates. Approximations. Vibrational Frequencies and Force Constants. Molecular orbital theory. Energy derivatives. Vibrational Absorption and Circular Dichroism. Vibrational absorption spectra. Vibrational circular dichroism spectra. Vibrational Raman and Raman Optical Activity. Vibrational Raman spectra. Vibrational Raman optical activity spectra. Applications of Symmetry. Introduction. symmetry operations and point groups. Representations. Vibrational properties. Principles of Spectral Measurements. Introduction. Polarization modulation using a photoelastic modulator. Polarization modulation using a quarter-wave retarder. Double polarization modulation. Dispersive spectrometers. Amplitude Division Interferometry. Introduction. Principles of measurements. Polarization Division Interferometry. Introduction. PDIs based on Wollaston prism. PDIs based on wire-grid beamsplitters. Principles of measurements. Additional modulations. Time resolved measurements. Double polarization modulation interferometers. Applications and Molecular Structure. Vibrational frequencies and absorption and Raman spectra. Vibrational circular dichroism spectra. Vibrational Raman optical activity spectra. Appendices. Summation convention for vector products. Harmonic oscillator integrals with dimensionless p and q operators. Some relations among dimensionless p and q operators. Polarized light. Summation convention for tensor products. Vibrational Raman optical activities. Classical expressions for A&agr;&bgr;&ggr; and G'&agr;&bgr;. Index. 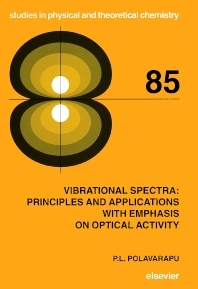 This book originated out of a desire to combine topics on vibrational absorption, Raman scattering, vibrational circular dichroism (VCD) and Raman optical activity (VROA) into one source. The theoretical details of these processes are presented in ten different chapters. Using dispersive and Fourier transform techniques, the instrumentation involved in these spectral measurements are given in three chapters. Major emphasis is placed on the newer techniques, i.e. VCD and VROA, with the conventional vibrational absorption and vibrational Raman scattering methods incorporated as natural parts of the newer methods. • Comprehensive coverage of vibrational circular dichroism and vibrational Raman optical activity. • Coverage of theoretical and instrumental details. • A comprehensive survey of VCD and VROA applications is included, so that the reader can get an overview of theory, instrumentation and applications in one source. The topics covered are of an advanced level, which makes this book invaluable for graduate students and practising scientists in vibrational spectroscopy. Professor Polavarapu obtained his Master of Science degree in 1972 from Birla Institute of Technology, Pilani, and earned his Ph. D at the Indian Institute of Technology, Madras (now renamed as Chennai). He conducted research at the University of Toledo, Toledo, OH, and Syracuse University, Syracuse, NY before joining Vanderbilt University, Nashville, TN, as an Assistant Professor of Chemistry, where he later became a Professor. Professor Polavarapu has made pioneering contributions in the research areas of specific optical rotation, vibrational Raman optical activity, vibrational circular dichroism, and electronic circular dichroism (collectively referred to as Chiroptical Spectroscopy). His research work led to determination of the absolute configurations of bromochlorofluoromethane and isoflurane (a fluorinated ether used as an anesthetic) for the first time. He has published approximately 260 peer reviewed research papers in leading scientific journals. Professor Polavarapu edited a book entitled “Polarization Division Interferometry” (John Wiley & Sons, 1997) with a contribution from Dr. John Mather, who won the 2006 Nobel Prize in Physics; published a solo book “Vibrational Spectroscopy: Principles and Applications with Emphasis on Optical Activity” (Elsevier, 1998); co-edited two volumes on “Comprehensive Chiroptical Spectroscopy” (John Wiley & Sons, 2012), with a contribution from Professor Ben Ferringa, who won the 2016 Nobel Prize in Chemistry. His latest book “Chiroptical Spectroscopy: Fundamentals and Applications” (CRC Press, 2016) was written to serve as a text book for graduate level course. Professor Polavarapu was awarded the Jeffrey Nordhaus Award (in 2010) for excellence in undergraduate teaching at Vanderbilt University. He was elected (in 2012) as a Fellow of the American Association for Advancement of Science (AAAS) for distinguished contributions to the field of chiral molecular structure determination. He was an Erudite Scholar (in November 2010) and Distinguished Consulting Research Professor (in 2012) at Mahatma Gandhi University, Kottayam. He currently serves on the editorial board of Chirality journal.